Maserati has, only in recent years, built a road car that could achieve 185 mph, and Premier Financial Services has leased plenty of them. But it’s probably a safe bet that Joe Walsh, rock guitarist and singer of the Eagles had put that notion into many peoples’ heads back in 1978 when he sang “Life’s Been Good”. The song might have forever connected Maserati with unruly rock star behavior, but it’s also a safe bet that few listeners knew much about the marque at the time. Enzo Ferrari was a teenager when the Maserati brothers began building and racing Grand Prix cars in 1914. 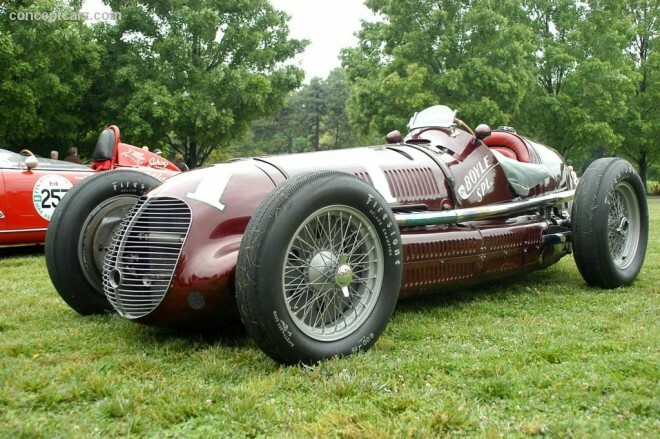 In 1926, they began making cars under their own name, and the first, the Tipo 26, won its class in that year’s Targa Florio with Alfieri Maserati driving. The trident that Maserati adopted as its symbol was inspired by the spear depicted with Roman mythology’s god of the sea, Neptune, and specifically the one in the Fountain of Neptune statue in Maserati’s original base, Bologna. The marque became a major force on the Grand Prix circuit, and the Maserati 8CTF even won the Indianapolis 500 in 1939 and 1940, with Wilbur Shaw driving. Juan Manuel Fangio became F1 Champion in 1954 and 1957 driving the Maserati 250F. Alfieri Maserati died in 1932, and the other brothers in 1937 sold their interest to the Orsi family, which moved the operation to Modena. 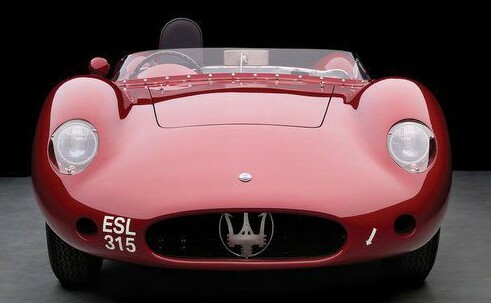 They remained under contract with the Orsis until 1947, just as the first Maserati road cars appeared. The A6 6-cylinder models were built in very small batches into 1956, and the line evolved into a series of coupes, roadsters, sports-racers and single-seaters. 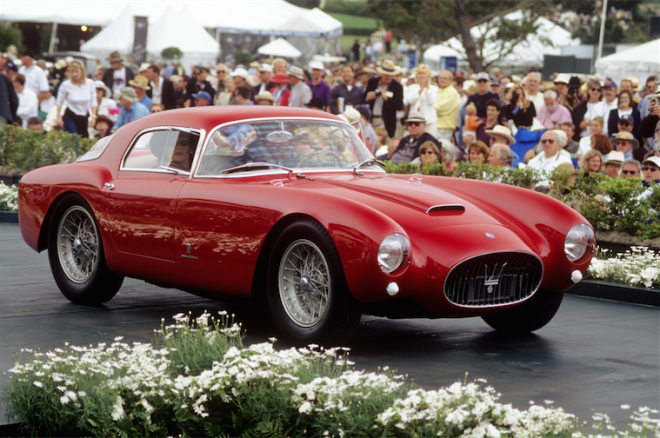 The A6 GCS/54 berlinetta by Zagato and the A6GCS sports-racer were among the fastest and prettiest. The marque built racecars into the early 1960s, including the Tipo 61 “Birdcage” that earned its nickname from a complex tube-frame chassis. 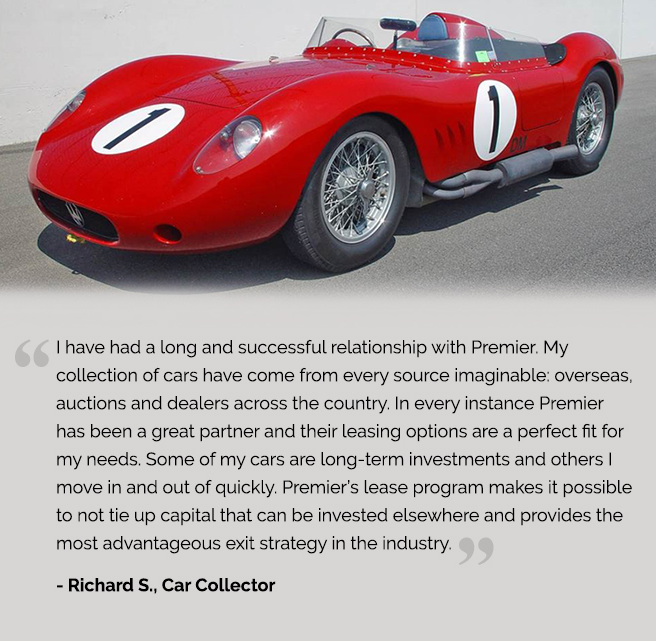 PFS has leased a number of the highly collectible Maserati sports racers from this period. Maserati had by then shifted its focus to serious road car production with the 3500 GT. 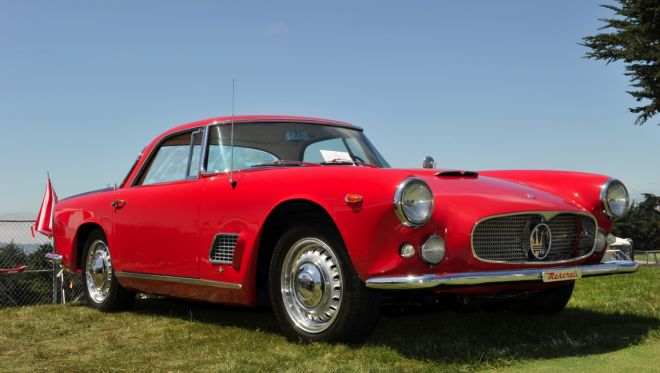 Some 2,000 coupes were made from 1957 through 1963, along with 245 Spyders by Vignale and a handful of specials by other carrozzeria. The 3.5-liter inline six made up to 235 hp in later fuel-injected form. Starting with a car commissioned by the Shah of Iran, Maserati also built about 30 5000 GT’s using the V8 derived from the 450S sports-racer. The Sebring came next, named for Fangio and Jean Behra winning the 12 Hours of Sebring five years before in a 450S. Just under 600 were built through 1968, later models having a 4.0-liter version of the six. Like the 3500 GT, the Sebring’s chassis featured a leaf-spring solid rear axle. The option of a 3-speed automatic underscored the marque’s luxury GT persona. In 1963, Maserati introduced the Frua-designed four-door Quattroporte with a V8 and 140-mph top speed – later raised to a claimed 158 with a 4.7-liter engine. Just over 700 of were built. Debuting that same year was the Frua-designed Mistral, a shorter-wheelbase GT with a gorgeous Spyder companion. In the mid-1970s TV show “Switch,” a conman-turned private eye played by Robert Wagner drove a Mistral coupe. The 1965 Mexico, based on a shortened Quattroporte chassis, continued Maserati’s migration to V8 power. 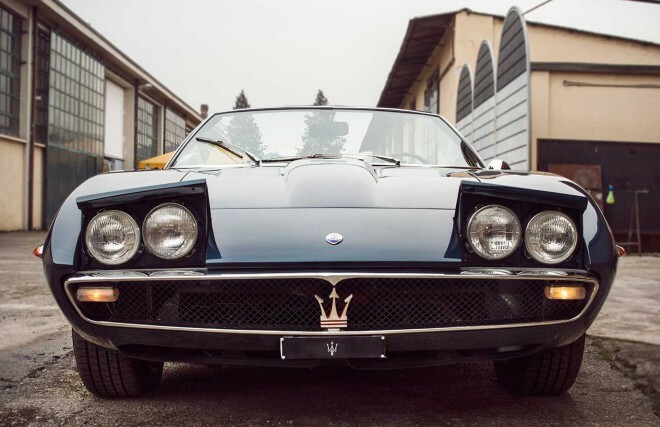 A 306-hp 4.7-liter V8 was was a centerpiece of the marque’s masterpiece, the 1967 Ghibli. The Ghibli’s stunning angular form, by Giorgetto Giugiaro for Ghia, set the tone for a new generation of Maserati GT’s to come. A production run of just under 1,200 coupes and 125 Spyders was similar to the Ferrari 365 GTB/4 Daytona, as was the 174-mph top speed of the 4.9-liter Ghibli SS. Under Citroen, Maserati produced a string of more advanced models, including the mid-engine Bora supercar and its V6 sibling, the Merak, and the Ghibli’s successor, the Khamsin, another stunner. Citroen threw in the towel in ’75, and Maserati landed under the control of Alejandro de Tomaso, the Argentine-born auto magnate renowned for the Ford-powered Mangusta and Pantera. The 1977 Kyalami was a slightly restyled de Tomaso Longchamp coupe with a Maserati V8 in place of the Ford engine. Of course, the de Tomaso period is best known for a car that proved the strength of the Maserati name – by not killing it. The 1985 Biturbo coupe resembled a BMW 3 Series and spawned a parade of bizarre looking offshoots. Sales soared for a while, but de Tomaso’s dream of broadening the marque crumbled under the weight of broken Biturbos. Fiat took over in 1993 and put Maserati back on a steady course, even giving it engines developed with Ferrari. Perhaps de Tomaso at least deserves credit for envisioning a new direction for Maserati, one that’s now flourishing under FCA with a growing range of GT coupes and convertibles, sedans and even an SUV.